Tattoo Blog » Time for Cartoon. Tattoo Blog » Tattoo Artists » Time for Cartoon. Mister Cartoon is not the sort of guy who seems content to simply stick to one thing. 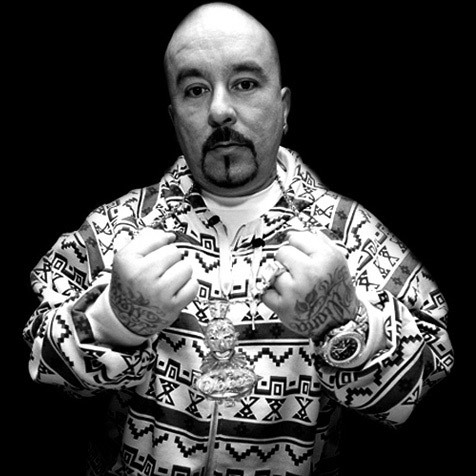 Growing up in San Pedro, California, Cartoon began his career as a graffiti artist then quickly moved on to a multitude of various jobs: illustrator for Hustler magazine, designing hip hop group album covers, creating custom car murals, gang inspired graffiti backdrops for film and magazine advertisements and eventually, tattoo artist. His tattoo work itself has received its share of spotlight thanks to the work he’s done for mainstream rap artists like OutKast, Cypress Hill, Eminem and 50 Cent, as well as pro basketballers such as Carlos Boozer of the Utah Jazz. In addition to Cartoon’s tattoo work, he’s also designed a limited edition Nike sneaker which Nike claims is among its most coveted releases in their history. As if all this weren’t more than enough work and attention for one person to handle, Imagine Entertainment co-chief Brian Grazer has signed a deal to produce a biopic on the life of Mark Machado, aka Mister Cartoon. Yet through all this, it’s especially strange to consider how many tattoo artists come from a graffiti background, and how big of a role graffiti played in their personal style and like Mister Cartoon, their current success. The tattoo artist can be celebrated by the mainstream now, everyone’s okay with that, but somehow graffiti art is still a criminal offense. It makes you wonder: if reality TV can stomach a half hour of people getting tattooed and if we live in a time when a tattoo artist can be a media darling, then will it be much longer before those forms of media and entertainment are turned on to the work of graffiti artists? All in due time, I guess. For now we’ll just have to wait and see how well a Hollywood film about a crazily successful tattoo artist does at the box office.